Fix It All Smartphone RepairNews & PromotionsUncategorizedThe right to fix it all….yourself? The right to fix it all….yourself? In recent news, Apple has been fighting laws that make it easier to repair your iPhone. Well, what is the Right to Repair Movement? 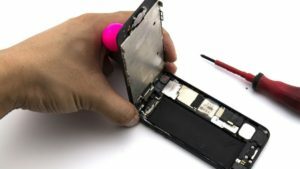 A bill is being considered in Nebraska for a “right to repair” proposal where device manufacturers like Apple and Samsung would be required to provide repair parts and manuals to customers and independent repair shops. Tech industry groups including CompTIA, the Consumer Technology Association, and the Information Technology Industry Council who represent some of the biggest tech giants such as Microsoft, Apple, Samsung, Google, Sony and Nintendo, are opposing the legislation as Buzzfeed reports. It is said that it would not only “reveal trade secrets” but also “jeopardize consumer safety and security,” which would make them vulnerable to hackers and improper repairs. If the repair bill ever passes, this would mean greater competition within the repair market which would help consumers repair their electronics at a more affordable cost. Should customers have the right to repair? Depending on the complexity and nature of the broken device, consumers should always seek professional and trusted advice. Although, most repairs are simpler than people would expect most consumers struggle to take a device apart and let’s not forget potential DIY disasters such as slicing a finger on cracked glass, exploding batteries and more. There there…it’s not too late..
Come and stop by at one of our stores, discuss with one of our technicians and we will gladly offer you advice on your device and a FREE diagnostic. Click here to find a Fix It All location nearest to you! Follow us on Twitter, to read more on latest news and updates. I support the “right to repair” proposal where Apple and Samsung would be required to provide repair parts to customers and all repair shops. Because this can help customers repair their devices at a more affordable and cheaper cost.